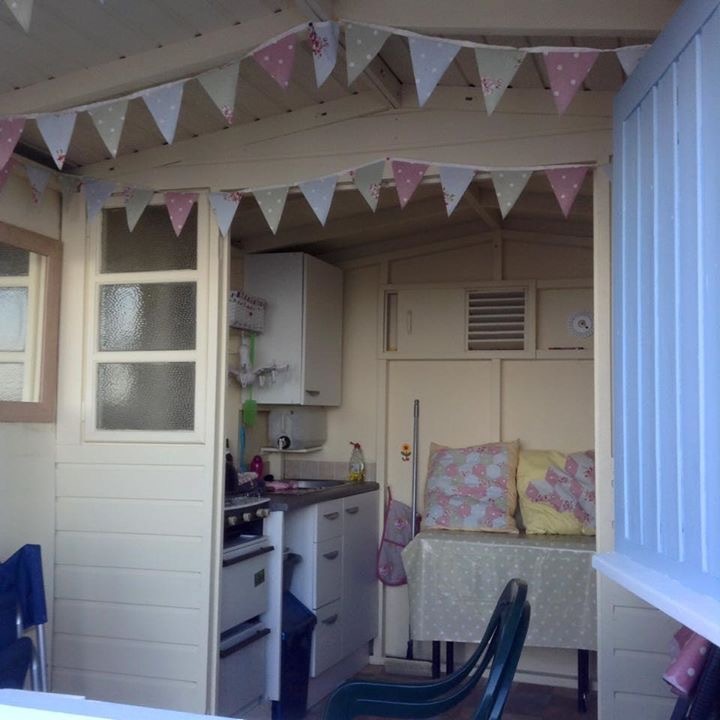 It’s no surprise given the style of our beach huts that I often get asked for interior decor advice or beach hut decor ideas. 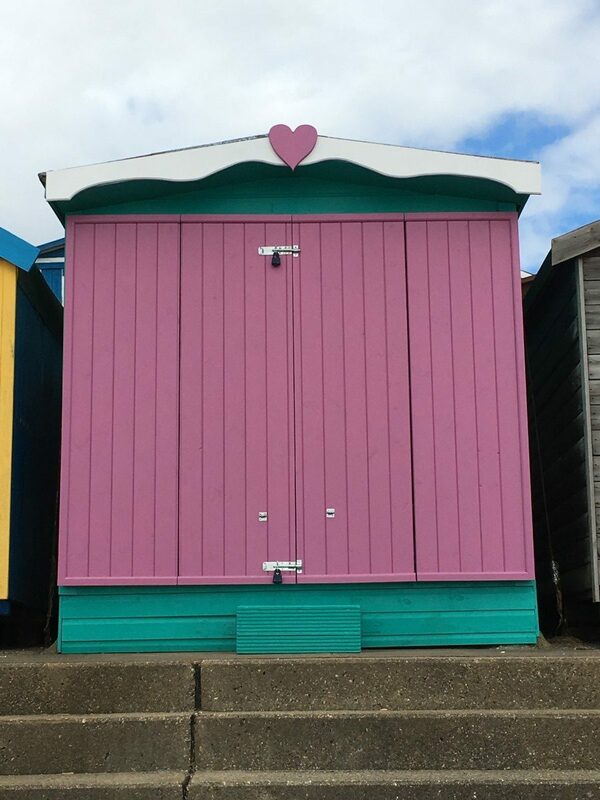 From paint, furniture and flooring to the accessories I add to each beach hut hire, I frequently get asked where and how I bought them. I’m always pleased to share, particularly if they will generate business for those very talented suppliers!! It may, therefore, surprise you that I never plan a beach hut decor and layout until after finding the beach hut and buying it. There is something about getting a feel for the beach hut itself, it’s location and understanding its style before making any decisions on the content. Whilst I knew that I wanted to use some items from the two beach huts I had for sale, I wanted to also inject some of Isla’s own personality into her too and that really drove my overall thinking behind her style. Every beach hut is special after all and should have their own story. So whether you are renovating a newly purchased beach hut or creating a beach hut/coastal themed room at home, or even if you have just bought a beach hut fully kitted out with contents and want to add your own stamp to it, I hope the below will help inspire your own beach hut decor. When I met Isla (sorry I refer to beach huts like people.. there is a bond now! ), I loved her vintage and ‘oldy’ feel right in the centre of Walton–the-Naze promenade. She’d clearly been loved by the family who had been using her but they hadn’t undertaken any DIY or maintenance for some time due to a busy family life. Whilst on the front row, the door and window were clumsy and heavy to open and the kitchen and sitting area the back felt underutilised due to the front’s design. But ooooh… I loved the rawness of the roof and that interior section – whilst I could have removed this section to open up the space, I really liked the vintage feel that it gave and wanted to keep some original features. I decided to keep this as a key feature of the beach huts decor. It would have been easy to have slapped some new paint on, update the flooring and paint the interior but I felt she had lots more potential! There was a stage after buying this beach hut that I wasn’t sure I’d ever open!! I went from not being able to decide on doors to having several different bits of advice from carpenters who were quoting for the work. A clear case of having an idea that just didn’t seem achievable. Whilst Isla’s original front and door were sound in terms of security and weather proof – it just didn’t make the most of being a front row beach hut and her view. Being raised up some steps and front row, she has an amazing view of the sea whether the tide is in or out. As we offer beach hut hire all year round (and I enjoy the winter days out with Millie), I had a vision of winter days sitting behind glass doors being able to watch the waves crash onto the promenade. So that made the choice simple – I’d need at least three quarter glass internal doors and for security I’d need storm doors too. BUT then I had the issue of using up too much space if the internal doors merely opened back into the hut – so that resulted in the idea of bi-folds and then the same issue externally. Don’t get me started on how they were going to be fixed when open and secure – there were one too many diagrams to try and solve that problem. Anyway, months later and I finally had a design of bi-fold external storm doors with bi-fold three-quarter glass internal doors – all of which had to be made to order and not particularly cheap. I would have to find ways to keep other costs down. Some designers suggest that you put your investment pieces front and centre and I’ve certainly taken this approach with Isla. 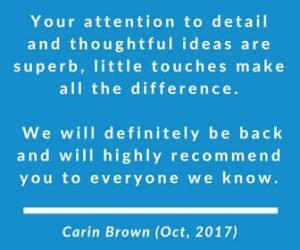 I’m so glad that I persevered and stuck it out with the vision – it was painful and costly BUT they really are Isla’s showcase feature. We hope you agree? There was a never a question about the type of paint, which was always going to be Sadolin SuperDec. Cara from Gillies & MacKay explains why paint is so important in this great video (https://youtu.be/aryS8rNooLc) on her new YouTube channel. When Cara, says Sadolin is the best, I don’t argue – she knows her stuff! BUT how on earth to choose the colours? Unlike my first two beach huts, where colours were restricted, the world was my oyster this time around! First a word of warning, it’s actually quite hard to get your hands on a colour chart. Be prepared to hunt one down and if you can’t find a local stockist that has some in stock there were very few online that had the full-colour chart available (or easy to find on their site!). This was the easiest site that I found to use (just remember to use the drop down to view all ranges including beach huts colours) – Decorating Warehouse – Sadolin Superdec. A second word of warning and most important, the colours on the chart do not look like the paint when it’s on the beach hut. I figured this out as I loved a pink that was in a picture of beach huts on the front of the colour chart and couldn’t find it anywhere in the guide. A quick message to Crown Decorating Centre via their facebook page and a HELP message to Cara and she guide me through it, also pointing out that you can ask for sample pots (250ml). You can order these sample pots online via the Decorating Warehouse at £3.95 per pot (perfect for using in the garden afterwards) or pick them up from your nearest stockist. It is worth calling in advance if travelling far as they may need to order them in – I found Brewers in Frinton-on-Sea particularly helpful. Once I had the pink colour code, it was easier for me to think about overall theme and colours. 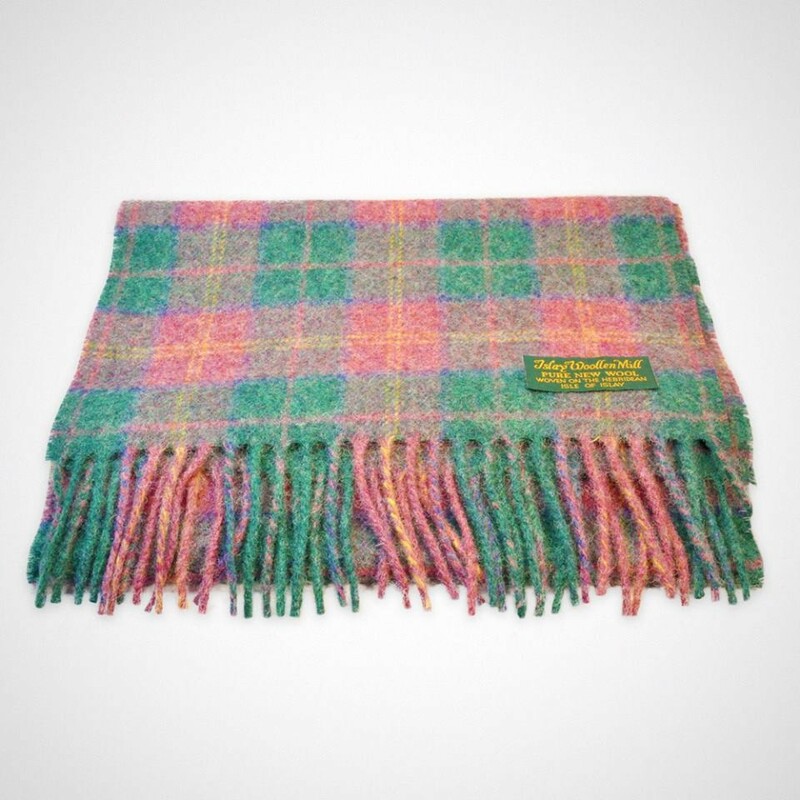 I’d spotted this great throw from Islay Woollen Mill when researching Isla’s name and was smitten. Their Isle of Islay Discover Tartan just seemed perfect, so I quickly ordered one and the green/pink contrast idea was set. So unlike my other huts where I found myself creating mood boards, Isla’s theme and colours became very much centred around this one throw. If you visit Isla then you’ll spot the throw sitting proudly on the day bed. I was a little bit nervous about going bold and contrasting the sides and main build with the storm doors – green and pink don’t go together after all. So huge thanks to Hello Sunshine Designs who mocked up a little version for me. We were all set now to give the colours to the carpenter and start on the interior. Exterior Paint Colours – Main Building Green (H8284K), Front Storm Doors (U8212S). 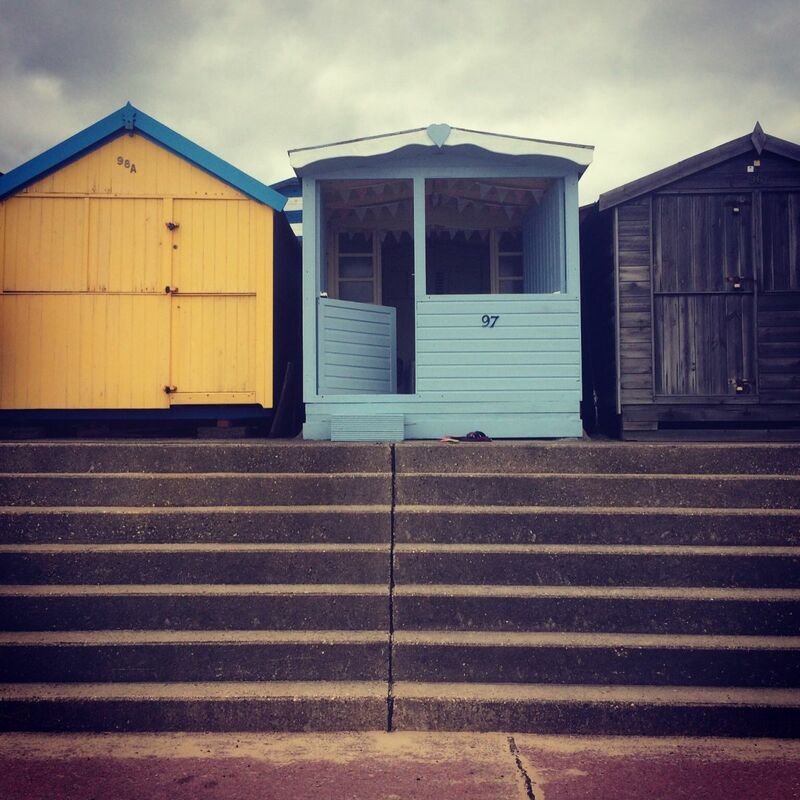 Seating is important in a beach hut, particularly when you offer beach hut hire and I had to think about its use both during winter and summer seasons. I always start with the seating position before placing other furniture. It can be hard to find the right height and size and I definitely recommend ensuring storage is available underneath. To make the most of the view, I knew I wanted to put the main seating at the back of the beach hut and ensure it was large enough for anyone to have a snooze! Whilst I scoured charity shops (think garden/conservatory furniture that could be sprayed/painted , Groupon deals and IKEA), I ended up coming back to this large day bed from Ikea. Whilst it’s black (and I have plans to brighten the colour), it takes up the full width of the beach hut and a perfect snooze space (with a good mattress!). If you have space, then this also has a pull out option which I’m sure will be made use of during those winter days. 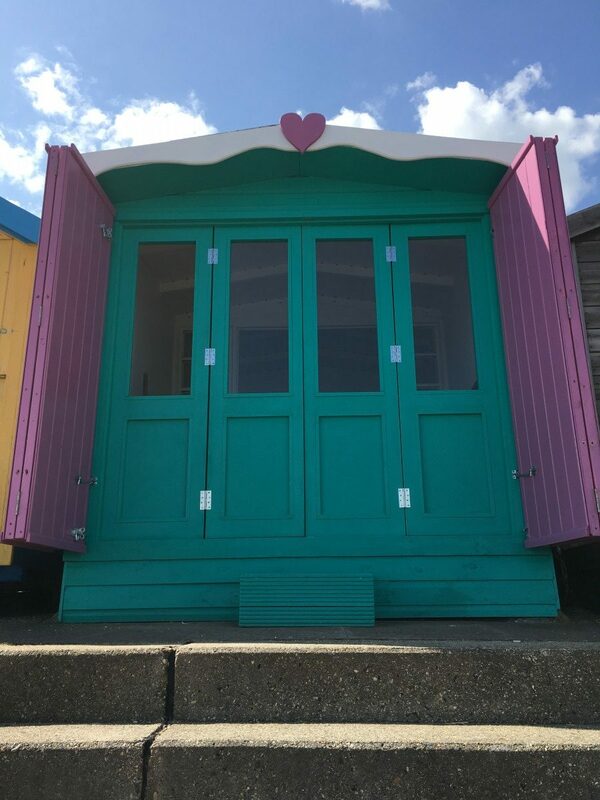 If you’ve had a beach hut hire day from us previously, you’ll recognise our dresser, table and chairs from Harley (who has now been sold due a change in licence conditions prohibiting beach hut hire). I purchased all of these items from The House that Craft Built. 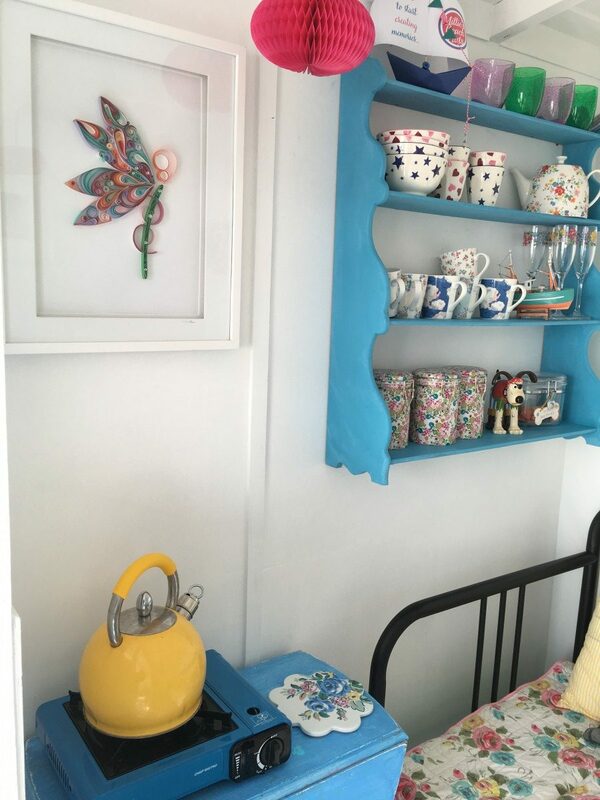 Not only did they take time sourcing the right furniture for me (I really wanted a barley leaf table to maximise space and the particular size of the dresser) but they lovingly restored and painted and then delivered to the beach hut for me! Amazing customer service and stunning work. I found Emma from Vintage Rocks through a facebook group and was so pleased to finally find someone who offered paint in bright bold colours along with shabby chic neutrals. Using Mineral and Lagoon colours, I was able to transform in just a few coats of paint, some pieces that I picked up from Age Concern furniture shop in Wokingham. They were a bargain with shelving from £10, the coffee table at £15 and side table at £15. Her paint is super easy and she arranged delivery the very next day for me at short notice. I’d recommend using the Finishing Creme – very easy to use. I’m a huge fan of the amazing Marnie Makes and her own ‘happy wall’ inspired Isla’s. With our love of small business accessories and artwork, it was the perfect way to show off these amazing talents. With a few familiar pieces from our previous beach huts, I also added some new favourites. ClimeMet – I can’t believe I only discovered these for the first time this year. Perfect for our beach huts with a gorgeous range of clocks and weather stations. Isla’s tide clock is perfect for Walton-on-the-Naze and will help you plan out your beach hut hire day. The Little Boathouse – Amanda was amazing to work with and designed our very own branded boat bunting which has battery lights! 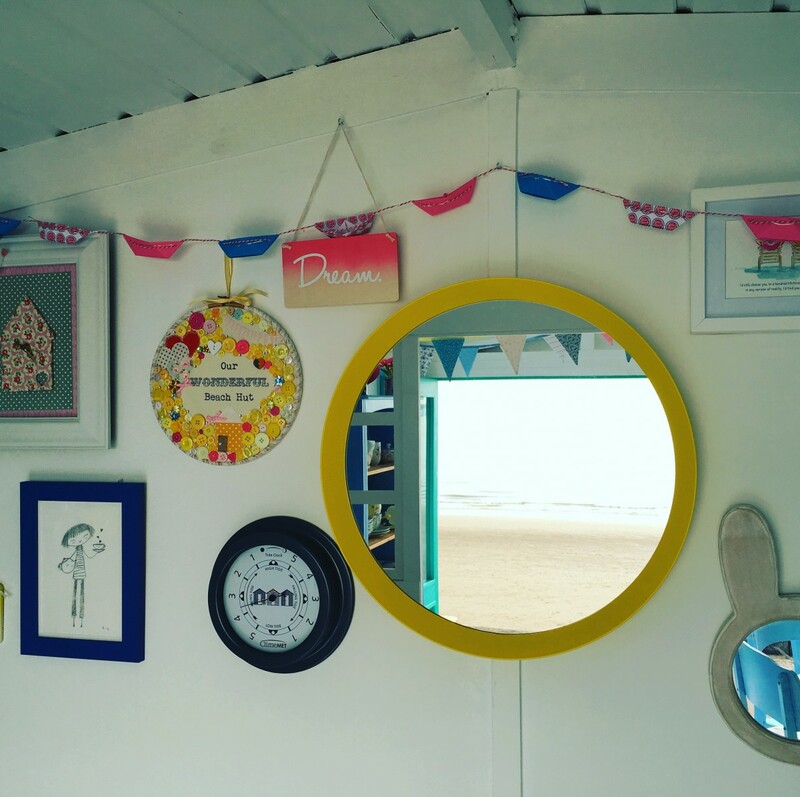 Marnie Makes – our beach hut decor is never complete until they have an original illustration from Marnie and we also have a couple of framed prints too. Dolly DearLove – what can I say, she always glitters with her fab hoop art and whilst no longer available to buy, are so special to us and our journey. 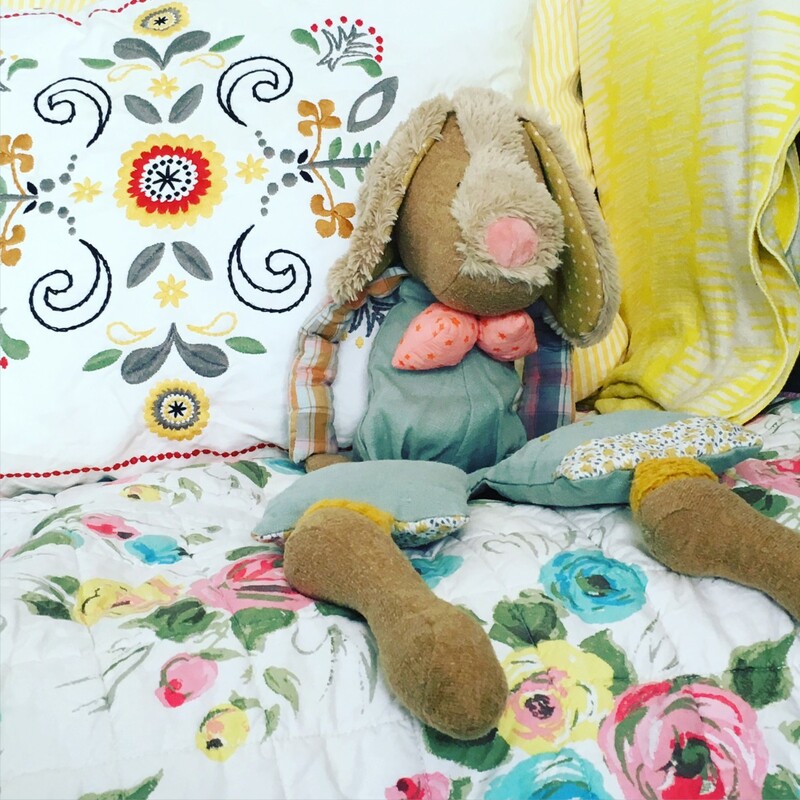 Ellies Beautiful Mess – one of my favourite Instagram pages and I’ve been holding onto this gorgeous bunny ears mirror for months, waiting to add her to Isla. Super cute! n.b the hanging signs can be found in John Lewis and round yellow mirror from Ikea. If you know us a little by now – you’ll know that all of our china and crockery is sourced from Cath Kidston. I believe in having a little luxury for the adults who visit (even if it feels like the kids are all having the fun!). From teapots to mugs to plates, they are all sourced via Cath Kidston. You’ll find a mix of the new Highgate Rose range and older Ditsy Mews in Isla and our mandatory cake stand in case you choose to have an afternoon tea. That’s the thing I love about Cath Kidston – you can easily buy one thing at a time, the mix and match approach looks great and makes it so much more interesting. I’d also recommend buying sets where they are available (cheaper than buying individually) and keeping an eye out for their sales – there is one on now!! 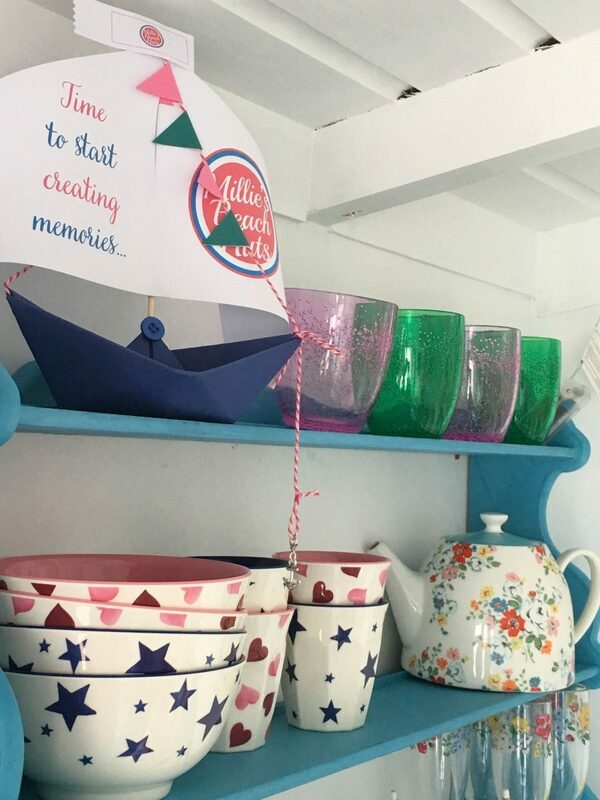 We always add children’s melamine into our beach huts too – Kirsty from The Retail Nurse helped track down Emma Bridgewater plates, cups and bowls along with our gorgeous Belle and Boo children’s cutlery. 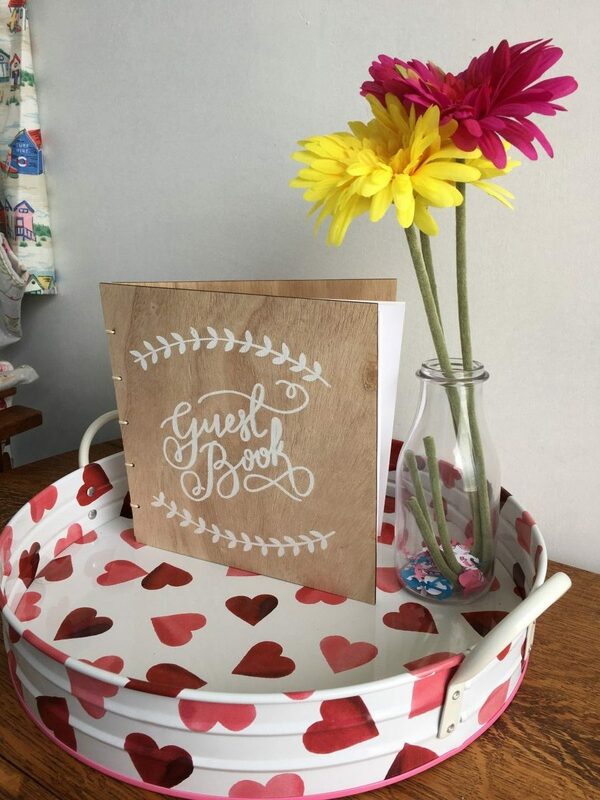 No need to worry about bringing your own supplies for them (and personally I’m a little clumsy so love using the pink hearts melamine!). Everyone needs their own four-legged friend when Millie isn’t around to visit! The Little Boathouse – Our welcome boat! Our aim is to make a space for you to create your own memories – Amanda captures our vision perfectly! I’ve been eyeing up these Emma Bridgewater trays for some time. Kirsty tracks them down again for us (note guest book from John Lewis). Carly creates the most stunning pieces of work and I was soo happy to snap one up (they go very quickly!!). Another great new find this year and can’t wait to see more of her creations. Looking for more Beach Hut Decor Ideas? Whilst I’m sure I’ve missed a number of items out from Isla in the above, if I’ve missed out one of your favourites just drop a comment below and I’ll make sure I respond with details. 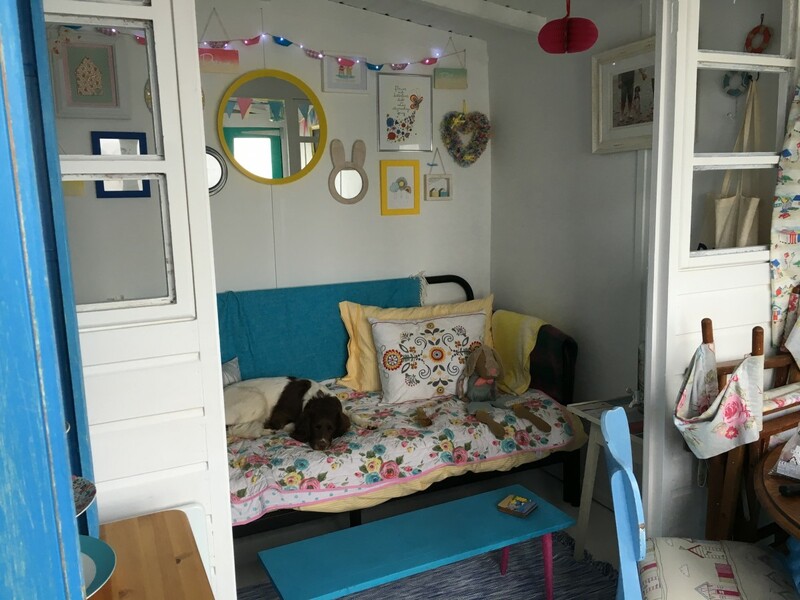 If you are still looking for ideas for your beach hut decor, you may also want to have a look at our previous blog post re Beach Hut Interior: How to Design and Decorate your Beach Hut. You’ll also find more inspiration on our Pinterest boards. Enjoy!! Be quick if you are looking for a summer date – these are very limited with just three school holiday dates left.